What is the National Counselor Examination for Licensure and Certification (NCE)? The National Counselor Examination for Licensure and Certification (NCE) is administered and maintained by the National Board for Certified Counselors (NBCC), an internationally-recognized provider of national counselor certification. It is part of counselor credentialing requirements for candidates seeking certification to practice as a counselor, and is intended as a method of assessment to determine whether these candidates have the abilities, knowledge and skills required of them to succeed in the position. The National Counseling Exam, or NCE, is an exam for those who wish to become counselors. The NCE measures the skills, knowledge, and abilities that are needed to provide effective counseling services. There are 200 questions on the NCE exam. The cutoff score to be considered as passing is in the high 90s. The cost to register for the NCE is $275. The National Counselor exam is a 200-question, multiple-choice, non-sectioned, pencil and paper formatted test. On the test, you will be presented with a series of questions created from the original eight Council for Accreditation of Counseling & Related Educational Programs (CACREP) content areas and five work behaviors from NBCC’s national job analysis. All of these questions have undergone review and field-testing prior to being included on the examination and a new version of the National Counselors exam is administered for each new test date. 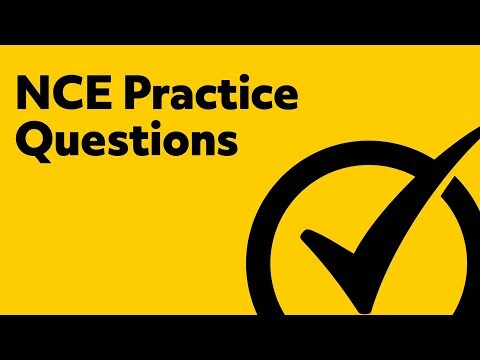 Of the 200 questions you will be asked, 160 are counted for scoring in order to determine whether you achieve a passing grade, with the remaining 40 being unscored field-test items used for statistics to gauge whether they should be used on future versions of the NCE exam. A more in-depth discussion of these content domains is available through Mometrix’s National Counselors exam preparation tools, which includes NCE study guides and NCE practice tests. 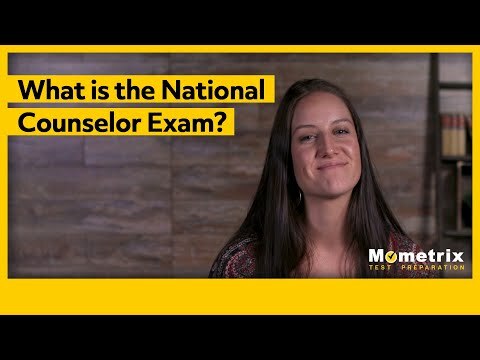 What is the National Counselor Examination? In order to register to take the National Counselor exam, you must first apply for certification. Once your application is accepted and approved, you may then proceed to register for the examination at an approved Pearson VUE test center. The NCE exam is administered twice a year, in both April and October. Typically, it is held on the third Saturday of the respective months. When you send in your registration, you will be asked to submit an appropriate fee, which can be paid with a credit card. Keep in mind that any application fees are neither refundable nor transferable, so plan your examination date accordingly. Your identification is required as a security measure in order to provide equal opportunity for all candidates to demonstrate their skills and abilities. Additional security measures include: no cameras, notes or related items permitted in the testing area; no calculators; no guests or visitors; no personal items permitted other than keys and wallets. All items you need for the NCE exam, including writing materials, will be provided at check in. If you fail to provide acceptable identification, fail to abide by the set security standards or arrive more than 15 minutes later than your designated exam time, you will not be admitted to the testing area and you will not be issued a refund, so be sure to plan ahead. If you need to postpone or defer your examination date to the next available administration, you may do so without penalty if you contact NBCC more than 30 days before your scheduled exam date. 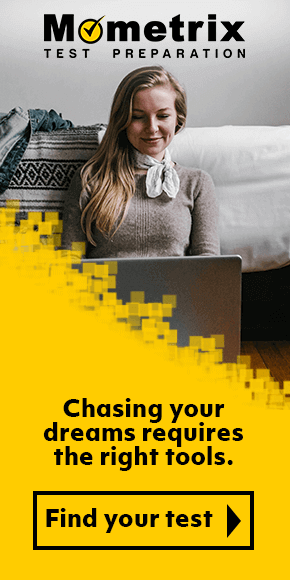 If you fail to contact NBCC within the allotted time frame, or you do not show up for your examination, you will be required to pay a $150 reregistration fee to take it on the next available administration date. The only exceptions would be in the event of an emergency, such as an accident or illness, which may waive the reregistration fee upon approval. If there are unforeseen circumstances, such as inclement weather, that prevent test administrators from opening the facility and require cancellation and rescheduling of the NCE examination on behalf of NBCC, you will receive an e-mail or telephone notification with instruction on how to reschedule your exam. Your National Counselor examination score is based on a modified Angoff method and is solely determined based on your performance on the examination, with no prior work experience or variables factored into your score. A passing score is determined by subject matter experts, who evaluate questions on the NCE exam to establish a number of correct responses that would adequately demonstrate the required level of proficiency. Since each version of the exam is different, the number of correct responses needed to obtain a passing score will vary slightly for each version. Your own capabilities will allow you to pass or fail the NCE exam, with no influence from other test takers. If you do not receive a passing score, you are permitted three attempts before your application is closed, so you may reregister and retake the NCE exam on the next available test day. Since you are expected to pass the exam prior to entering the professional field, it is essential to prepare for the National Counselors exam as best you can prior to your first attempt. The most effective method to make sure you are well-equipped for success is by utilizing resources available to you. 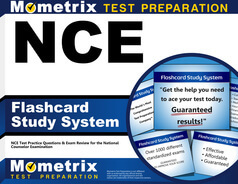 Mometrix has prepared study materials for your NCE exam prep that includes both an NCE study guide and an NCE practice test with NCE practice questions that have been designed to help you assess your skills and review the CACREP and work behavior domains that you will encounter on test day. Mometrix Academy is a completely free NCE exam prep resource provided by Mometrix Test Preparation. 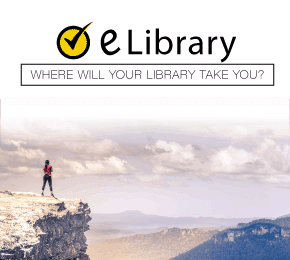 If you find benefit from our efforts here, check out our premium quality NCE study guide to take your studying to the next level. Just click the National Counselor Exam study guide link below. Your purchase also helps us make even more great, free National Counseling exam content for test-takers. Our customers love the tutorial videos from Mometrix Academy that we have incorporated into our NCE test study guide. The NCE study guide reviews below are examples of customer experiences. This book was easy to read & great for review. I passed my test first try & didn’t really study other than flipping thru this book. If you’re someone who plans to really study for this exam, I definitely recommend this book because it’s an easy way to get a lot of info in a short amount of time! I bought this book with 3 weeks left to study for the NCE. I also bought the Rosenthal Encyclopedia and practice tests from the makers of this book. I made notecards from all the info In this book and took the practice test the night before the test. I passed with flying colors! I briefly glanced at the Rosenthal encyclopedia the night before. It has great information and questions, but the size of the book itself was overwhelming for me. This book skipped the fluff, was easy to follow and has simple explanations. I pretty much used this book as a stand alone study guide and only glanced at the others because I spent so much money on them. I highly recommend this as a study guide for the NCE! Good information! I appreciate being able to take a practice test after studying and then comparing the answers with the ones provided in the back of the study guide. I appreciate how thorough the answers were to the test. It allowed me to understand how and why I missed some of the questions. Excellent study material. The book was excellent in narrowing my study to key points in each category that will be on the test. I liked how the book left room for notes as well as definitions and important names in each category. I am looking forward to taking the practice test. One of the reasons I purchased the book was because it not only offered hints to better testing and the material, but included a practice test. I have just started reading through the book and have already found it very helpful. The important terms for each subject matter has been very insightful. l have also been happy to have the practice test to review study questions. I am feeling much more prepared for my exam next month! I like this guide because it’s not an exam question type of guide and there’s a lot less unnecessary information. This guide is more like a textbook. It is more enjoyable to read, straight to the point, and the information seems to stick with me better than other guides I have used. This is a great additional asset to my study routine. Thank you for this well thought out study guide! Another great resource from Mometrix. Couldn’t be happier that this was recommended as a study resource for my NCE exam. I believe this will help me get well prepared for my exam. Thank you for this resource. I feel the Mometrix flashcards have been a big help in separating the categories with the most questions to help me absorb the various concepts. 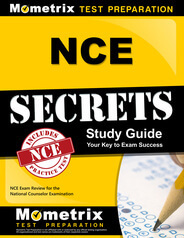 I feel the NCE Secrets Study Guide helps with the study tips, what words to look for and to avoid, as well as including a practice test. One of the best study guides I’ve come across. I highly recommend it to anyone attempting the NCE exam. I was very happy to see all categories broken down and easily explained. I have other prep materials but so far this study guide is my favorite.